We love him! No, we hate him! Our feelings are in turmoil! TURMOIL! When we first saw the Big B in an ad for Nishabd, we hissed. (We don't know why, we just did.) But when we saw the Big B in some 1970s bellbottoms, all gangly limbs and zany jump-kicks, we softened a bit. But no! We must not soften! Our mind was made up. 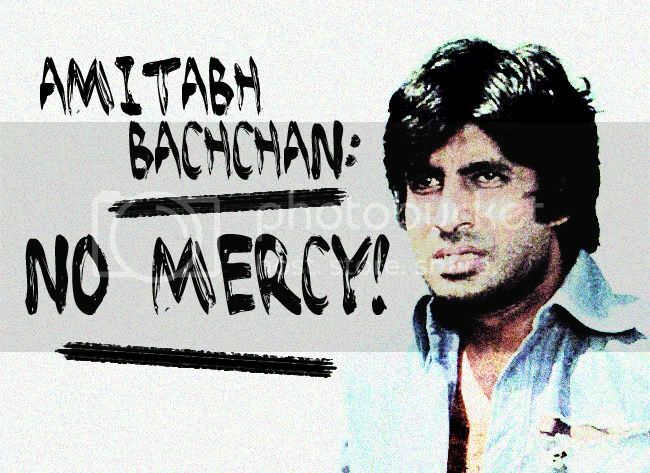 There is room in our heart only enough for Naseer and Om, Amitabh cannot fit inside and certainly neither can his Big B. We are taking an aesthetic stance here: No, Amitabh. We will not like you! We will deflect your magnetic charisma and beam it onto something with yellowing film and a jumpy soundtrack! You will not hypnotize us as you shake your booty and chew paan. Back, back, demon King of Bollywood pop icon! Back, I say! In an effort to soothe our turbulent heart and ascertain that we do not, in fact, like Amitabh Bachchan and never, ever will, we have instituted this project, wherein we will showcase merciless clips of Amitabh being unlikable. If we allow any likable clips through, we fail! We feel the same way! We dropped the fish, too! So unlikable! I don't know you, but I feel I love you. This site rocks, and I'm linking you right now.